No, this article isn't about the three major U.S. auto manufacturers or a trio of basketball players. This post is going to hone in and focus on the three major expenses that most of us face and why it's so important to minimize these as much as possible. I'm also going to provide you with examples where I have done my best to minimize these expenses. There are a lot of personal finance articles that talk about cutting out that daily latte or skipping the sports package that your cable company wants to sell you. Forget all that. If you really want to retire at a young age or achieve financial independence while you're young enough to enjoy it you need to focus your attention on "The Big Three": Housing, Transportation and Food. Once you have these three under control the rest of your expenses will take care of themselves. Housing is by far the biggest financial outlay for many of us. 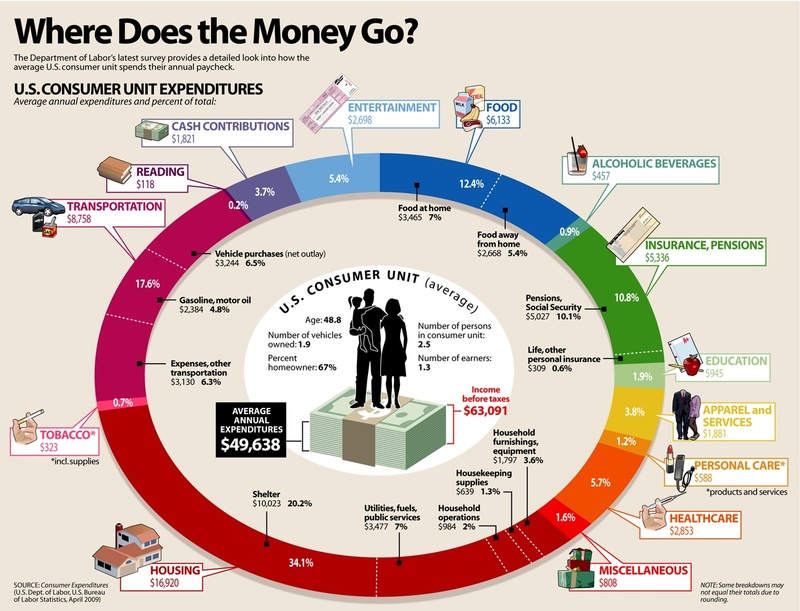 For the average American consumer unit*, the annual housing expenses are $16,920 a year. That's a significant annual expenditure! For one to be able to cover that type of expense, a portfolio of $423,000 would be necessary using a 4% safe withdrawal rate. That's over $400k necessary just to put a roof over your head. That is insane! As I've talked about numerous times on this blog, I feel living frugally is absolutely imperative to retiring early. Being able to save large swaths of your net income every single month is much more important than your ability to earn a higher rate of return on your money. This is especially true for someone who doesn't have an investment horizon of 40 years, as in anyone who's looking to become financially independent at young age. I documented my move to a cheaper, smaller apartment back in late 2011. I decided to take the opportunity to move into a more affordable apartment located closer to the bus line and save larger portions of my net income. Currently, my girlfriend, her child and I live in a 900 square foot 2-bedroom apartment for $915 per month. My portion is half of that, at $457.50. That means a portfolio of $137,400 at a withdrawal rate of 4% would be required to sustain my shelter. That's a tad more reasonable. If you're spending anywhere near $17,000 on housing you likely need to cut that pretty dramatically unless you're earning a 6-figure income and you're already saving over 50% of your net income. For the rest of us mere mortals, cutting housing is theFIRST step to becoming more frugal and making serious strides towards financial independence. Some of us need to downsize. The average size of a home here in America has been getting bigger and bigger and has more than doubled since the 1950's. Currently the average home is over 2,000 square feet. Is that necessary? Maybe you feel it's necessary, but believe me it's not. We have three people living in 900 sq. feet and it's really more than big enough. We could easily get by in a smaller space. I'm not talking about getting extreme and moving into a tent or an RV or something, but look around you. Do you need 1,000 square feet per person in your family? Do you need that extra bedroom/bathroom/den? Do you need the garage to store a bunch of stuff you don't really need? Or do you need more time to cultivate your life, spend more time with family and friends and master your hobbies? That big house will eventually own you, rather than you owning it. Transportation is also a large expenditure for many of us. America was founded on the automobile, and we have a large interstate highway system crisscrossing the entire country. Many cities and suburbs are laid out in grids and connected to freeways that can get you to far away places in short order in your personal car or truck. According the source used above, transportation expenses is the second biggest expense for us at $8,758 per year. That's a shitload of money folks. Using the numbers above, that requires a portfolio of $218,950. Is your transportation worth over $200k? I've been mostly car-free for almost two years now. I moved to the apartment I live in now to be within walking distance to the bus stop. This bus takes me to work every morning and brings me home every evening. It costs $1.25 per ride. That's easy math. I also use a 16 year old 49cc scooter for trips to work when the bus is running late or for trips to the grocery store, pharmacy and anywhere else I need to go. It gets over 60 mpg. It has a 1-gallon fuel tank. It requires almost no maintenance. My transportation costs are well under $1,200 per year and that's factoring in an amortization of the actual cost of the scooter. That means the value of my portfolio that covers my transportation needs to be $30,000. Certainly much more attainable than over $200k. I can almost save that much money in a year and transport myself for the rest of my life. What do you really want? A nice, shiny car to drive you to a job you don't really care for? If that's what you want then you're probably going to be somewhere closer to that average expense level listed above. If what really matters to you, however, is living more and working less than you need to find a way to lessen the transportation expenses as much as possible. You don't need to get down to my level to achieve success in this area, but if you're spending multiple hundreds of dollars per month on transportation you may want to take a look at that and really ask yourself if you're doing what's best for your financial future. Try carpooling. If you live less than 10 miles from work, get a scooter like I did or get a bicycle and ride into work. Live closer? Walk. Live 40 miles away? Move closer. Seriously. Mmm, food. Who doesn't love good food? I'm certainly not one to argue if you love to eat great food. However, as with anything else in life moderation is probably best. If you're constantly eating out and consuming freshly prepared 3-course meals this experience loses its specialness. I don't eat out often. Maybe once a month or so. Sometimes less. But when I do go out to eat, it's a great experience. It's a treat! This is usually the third largest expense for many of us, and the average cost of food for us Americans lands at $6,133. This type of cost layout would require a portfolio of $153,325 using the 4% SWR. I'm not spending quite this much on food, although I will admit even I could use some more discipline in regards to food. I typically try to spend less than $280 per month in food, and that includes spending money on food for both my girlfriend and I when we go out to eat or pick up takeout on the weekends. As mentioned above, I don't do this too often. But it isn't just about cutting the restaurant visits. It's about cutting that grocery bill as well. During the workweek, I typically get home around 6:30 and make a couple sandwiches before changing into my workout gear and jogging to the gym. Sometimes this is peanut butter and jelly and other times it's a few slices of deli meat and some cheese. It's not gourmet eating, but it provides a lot of the nutrients I need and it's cheap. The weekend is a bit looser, and this is where the occasional restaurant visit or Saturday night pizza comes into play. I could easily get the food budget under $200, but I'm spending at a level that doesn't require any sacrifice at all. At my typical spending level I need a portfolio of $84,000 to feed myself for life. I've already eclipsed this level, which means that no matter what happens in life I'll never starve. I can basically eat for free for the rest of my life! I'm not going to preach too much here. Food is a very individualistic and relative thing. Maybe you don't like sandwiches. You don't have to. Buying chicken breast in bulk and cooking up a small dish of chicken breast and some rice for dinner is cheap and very healthy. Maybe you like a little pasta. It doesn't take much effort or money to put some noodles and sauce together. Add a little meat and you've got a cheap and easy meal. You can usually make this in large batches and eat for the week. Add a big can of soup to some rice and that will also feed you cheaply. Again, you don't have to be extreme here but taking the budget seriously and respecting the fact that food adds up quickly can make a big difference in your bottom line and your ability to reach financial independence at a young age. You don't have to eat rice and beans for the rest of your life, but prioritize a bit. Eating out more than twice a month, eating steak often enough to where you can regularly recall what it tastes like and spending more than $400 per month on food (even if you have children) will likely significantly reduce the likelihood of your ability to retire at a young age. I like eating well and try to have a good meal at least a couple times a month. But, again, eating great food every single month is easy to adapt to. I savor it more when it's hitting my palate after a steady week of PB&J sandwiches. I eat like a college student, but I'll be financially independent at a younger age than most can ever imagine. Think about that. Taking a look at just these three expenses, it's easy to see the difference between myself and the average. At an average expense level, a portfolio of almost $800,000would be necessary just to cover The Big Three. Looking at myself, I'll need just$320,725 to cover these basic expenses if I can keep them at a similar level to what I'm spending now. That's a difference of almost $500k! I'm trying to retire by 40 years old. I want to become financially independent so that I can live more and work less. I want to be me! I don't want to live the 9-5 till' 65 routine. I don't want to be forced to go in when I'm not feeling well or when I'm burned out. I don't want to have to grit my way through a Monday morning when all I want to do is spend the morning at the beach. But without freedom, financial freedom, you don't have these choices. You have to work for a living. The quicker you realize what expenses are holding you back, and the faster you can reduce these expenditures, the faster you'll have that freedom! 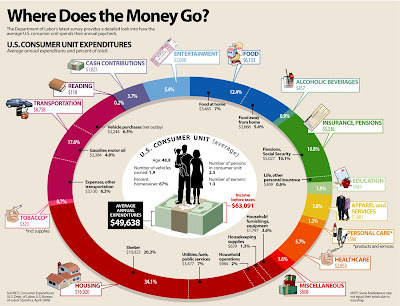 *U.S. Consumer Unit - 2.5 people in household and 1.3 earners.